David Bedbrook had a long professional career as an Agricultural Consultant. In recognition of the immense contribution that David Bedbrook made to the Association of Agricultural Consultants (AAAC(WA)) and to consulting as a profession the AAAC(WA) has established the ‘David Bedbrook Bursary’. The David Bedbrook Bursary has been developed to support the next generation of agricultural leaders, who will take up the challenge of farming for the future. It is for young people who are passionate about agriculture, with a keen interest in the future of our industries and who are ready to expand their networks and learn new skills. To apply for the David Bedbrook Bursary in 2019 please refer to the following information and application form. Bursary applications close on 30 April 2019. In 2018 it was my honour to be named one of the two inaugural winners of the David Bedbrook bursary provided by the Australian Association of Agricultural Consultants (AAAC). 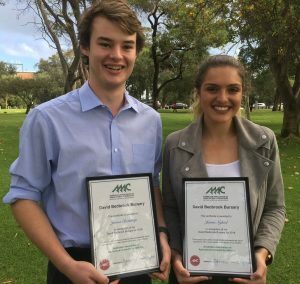 This award was a very special opportunity for me to be able to network with some of West Australian agriculture’s brightest minds who are very passionate about supporting the next generation of agriculturalists. I used this bursary to complete a three day intensive course in artificial insemination which taught me the fundamentals of artificial breeding technology as well as the correct techniques when artificially inseminating cattle. Prior to this I also spent a week at the Lawson Angus cattle stud in Young’s Siding in the South West of WA learning about their breeding program and how artificial insemination was utilised in a world class operation. This award allowed me to better understand how breeding technologies can be integrated into WA cattle operations and how this helps our industry to continue improving the results achieved by producers. In addition it has also helped me to network with prominent and informative members of the Australian agricultural industry which was invaluable to advancing my future opportunities. The David Bedbrook Bursary has motivated me to continue to learn and improve my skills in agriculture and the members of the AAAC I have had the pleasure of interacting with have truly been inspiring.